What Can I Grow As Stock Feed In SE Queensland? We live on 1 acre of land at Boonah, Qld approx same temperature as Ipswich, Qld, in black soil country. We run our own poultry and a pig and are working towards a reasonable self-sufficiency with substantial vegetable garden, orchard, plus a food forest. What I am wishing to do is try to cut back on the feed costs for these animals, by way of growing a tree of some sort on our property, instead of the large outlay of animal pellets. Do you know if Spanish Chestnut would grow here, or my thoughts were Carob or Avocado, have you any suggestion that can help us? In warm climates, use Arrowroot as an alternative to comfrey for composting and mulching. In fact this drought tolerant perennial is superior to comfrey because it also yields edible rhizomes and shoot tips. Carob is a good choice. Don’t think about growing sweet chestnuts – SE Qld is too dry and the winters are too warm and brief. Even in the Blue Mountains (NSW) sweet chestnuts produce small, dry nuts when compared to the results you get from a cool, damp temperate European climate with more fertile soil. Put Queensland arrowroot (Canna edulis) in your top five fodder/ composting crops for livestock – in the subtropics this is my substitute for comfrey. In a trial in my garden, I produced ten times the arrowroot leaf and stem harvest by using one quarter of the water as compared with comfrey. Never grow comfrey in a chicken run or fertilise it with poultry manure. Poultry manure makes comfrey toxic to chickens. Queensland arrowroot rhizomes are useful as stock fodder. Rhizomes are carbohydrate rich, and the fresh leaves and stems contain up to 10% protein. In a good year, I can cut them down three to eight times during the warm seasons, harvesting stems and leaves for mulching and compost making. Plants grown for fodder need occasional watering, but if you want a good crop of rhizomes for human consumption, plant rhizome sections 45cm apart at Christmas. Water weekly in dry weather and harvest in May. I get around 45 kg of rhizomes from 10 square metres of soil. Queensland arrowroot flourishes in damp to moist conditions, so I wouldn’t recommend planting them around dams or waterways. My guinea pigs eat young leaves. I also use the leaves as disposable plates for picnic food. For human use, rhizomes are picked when fully formed – about the size of a fist. 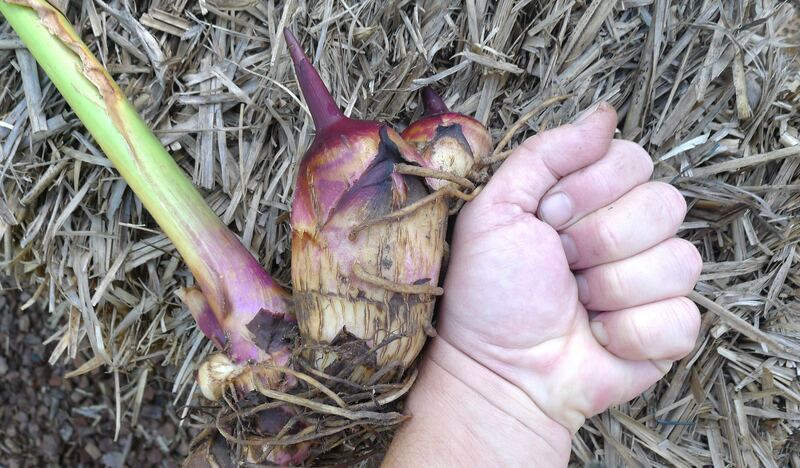 Fresh rhizomes are plump and crisp – the best quality have a shiny, purple outer skin. Peel, then slice thinly (like potato crisps) and soak them in water for six hours, ideally overnight. This leaches out the excess arrowroot starch, and makes them palatable for humans. Slow roast or simmer sliced rhizomes until soft. Their flavour and texture is reminiscent of water chestnut. Sweet potato (Ipomoea batatas) is useful fodder. Leafy shoot tips are great food (bland tasting, but OK if used in small amounts in stir fries) plus the tubers provide carbohydrate. I get monthly crops of foliage and three crops of tubers a year. Green waste is also good for composting. Like arrowroot, they need very little water. The sweet potato growing in my nature strip gets watered once a month in dry weather. ‘Beauregard’ is the common, orange-fleshed sweetpotato cultivar sold in supermarkets. In spring and summer, ‘Beauregard’ can produce a crop within ten weeks, which is why farmers prefer it. To assist with early cropping, apply mineral rock dust to the soil before planting. You can buy and plant tubers to get started. After that, take stem sections 30cm long and insert 25cm of their length in the soil. Water regularly until they establish a good root system. Lemongrass (Cymbopogon citratus), can become infected by rust disease, reducing its usefulness in the kitchen. I grow rust-resistant East Indian lemongrass (Cymbopogon flexuosus). Both can self-seed, so remove flowerheads. Plants needs watering to establish and to produce juicy stem bases during drought. Leaves can be cut for animal bedding, for mulching or for compost making. Use sunflower (Helianthus annuus) for green manuring and compost making. Mature seed heads, complete with seeds, can be used as a source of protein and oil-rich stock feed. The most economical seed are sold in produce stores as parrot food. Chinese spinach, Amaranthus spp, including A. hypochondriacus) is good when picked very young – around 15-20cm high – which is when they are very tender. I use them in stir fries, as spinach curry, etc. The seeds are oil and protein rich and were once more widely used to make gluten-free flour. As Chinese spinach matures it’s great for composting and fodder. Chinese spinach attracts caterpillars, and by growing them in between corn they can attract caterpillars away from the corn, reducing any need to spray. I sow Chinese spinach in the warm seasons, but seed will germinate in warm periods during winter. Seedlings need regular watering to establish, but maturing plants don’t need very much water. Lagos spinach (Celosia spicata) can be grown all year round in a frost-free climate. It is one of the most popular leaf vegetables in tropical west Africa. Usually grown in Australia for its flowers, which can be dried, seedlings and young plants can be cooked like Chinese spinach. Flowers attract butterflies and many other beneficial insects. By sowing Lagos spinach in late summer, plants can flower throughout winter, providing bees with nectar. Golden cosmos (Cosmos sulphureus) and king’s salad (Cosmos caudatus) are quick growing edible annuals. Normally grown as ornamentals in Australia, in tropical countries young leaves are steamed, cooked or eaten raw in salads, stir fries and spring rolls. Like Lagos spinach, they attract beneficial insects. They also self-seed readily and, in a frost-free climate, can be sown any month of the year. If you can water, and can prepare blocks of soil for growing green manures, try lentils, chickpeas, mizuna, rocket, mustard, lucerne, millet, barley, peas, beans, and maize (corn). Apart from being suitable for green manuring and for compost making, they can be grazed by stock. Choko shoot tips, which I use in stir fries, can be fed to poultry and livestock. As for carob, you’ll need to get male and female trees for seed production, and you plant one male to pollinate six female trees. This tree is adapted to winter rain and summer drought, so they grow best in WA’s dry temperate climate. Their shoots, leaves and pods make nutritious fodder. I have observed that in warm temperate Sydney, which has wet, humid summers, that fungal infection can result in poor pod production. If you generally grow non-hybrid cultivars you can save your own seed from them year in year out. Home saved seed is a quick, cheap way of bulking up your seed supply for future crops plus, over about five years of seed saving, these annuals will adapt – they acclimatise – to local soils and conditions. Membership of the Seed Savers’ Network entitles you to share the seed resources within your Local Seed Network free. Buy a copy of The Seed Savers’ Manual and discover how to save seed of over 100 different kinds of crop plant. My chickens love the canna edulis. I’m currently trying to propagate more as my current bunches can’t keep up.